Human connection has emerged as the common theme of this year’s Argentum Best of the Best award winners. By offering empathy to adult children, fostering bonds between residents and their peers, including young people in community activities, and inviting residents to plan their own programming, these four providers are bringing people together in new ways. 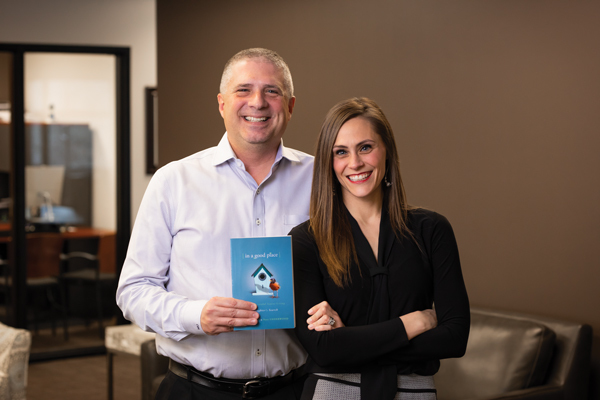 A book written by two members of the Heritage Communities leadership team uses a relatable main character to help adult children cope with the emotions of moving their parents into senior living. At Brookdale Canyon Lakes, a resident-produced broadcast has increased engagement among residents, families, and the community at large. Reaching out to the youngest generations, Senior Living Communities began an initiative to build relationships with local youth organizations. Finally, Benchmark’s The Village at Buckland Court invited residents to take the lead in designing the community’s adult education program. Meet our 2019 Best of the Best award winners. Navigating the journey toward placing a parent in senior living can be an emotionally challenging experience for adult children. When Heritage Communities decided to create a book to guide adult children through the decision-making process, the leadership team took a unique approach. Instead of writing an advice manual, they chose to craft a novel that follows a relatable character as she realizes that her mother would be safer and happier living in a senior living community. Heritage Communities president Nate Underwood and corporate director of sales and marketing Lacy Jungman. “In a Good Place” is a fictional story based on the experiences of real-life families served by Heritage Communities. The story follows a middle-aged woman as she struggles to care for her aging mother while managing her own growing children, marriage, and career. As the book progresses, the main character realizes that it’s time to find a senior living community for her mother. The heroine is purposely left nameless so readers can imagine themselves in her place. Heritage Communities president Nate Underwood and corporate director of sales and marketing Lacy Jungman spent 18 months creating the book. They consulted with sales leaders at each community for input. The book debuted during National Assisted Living Week in 2018. The book is meant to support the adult child’s emotional journey through the decision-making process. Readers learn that there is hope in this challenging time and that other people are facing the same issues. The storyline emphasizes the positive outcomes of moving a parent into senior living and acknowledges that the decision to do so can be difficult. Adult children and family members who express an interest in Heritage Communities receive copies of the book from the organization’s sales counselors. The counselors highlight or bookmark sections that will be of particular help to an individual they are advising. Counselors can then offer a next step to help the prospect along their journey. Presenting the book in this way positions the counselor as a knowledgeable advisor and helps deepen the relationship between the potential customer and the community. Distributing the book one-on-one with each adult child or in physician’s offices builds trust and credibility for Heritage Communities and its representatives. The book also positions the provider as a thought leader in the industry. Each of the company’s communities throughout Iowa, Nebraska, and Arizona received a supply of books to offer free to the general public. The success of “In a Good Place” has fostered a sense of pride within the Heritage Communities organization. The book received positive feedback since it was distributed in the communities in October 2018. Associates at all levels have asked for copies of the book to read, share, or keep for themselves. Sales teams reported that prospects were often deeply moved by the story and could relate to the character’s emotions in their own lives. The book was also endorsed by the Nebraska Health Care Association and Nebraska Assisted Living Association. Plans are underway to host book signings in the communities and at offsite referral locations. These events are expected to generate new leads and nurture existing prospects. The events will also help maintain good relationships with the families of current residents, who can relate to the messages in the book. The success of “In a Good Place” has prompted plans to create additional books in a series about senior living. “This Week at Canyon Lakes” is a weekly news broadcast produced by residents and associates at Brookdale Canyon Lakes in Kennewick, Wash. The show features reports and interviews highlighting community engagement opportunities along with the personal stories and talents of individual residents. The program entertains and engages the residents, families, and community at large who watch it every week. It encourages families to stay informed about what their loved ones are doing and encourages them to get involved. It also effectively motivates residents to engage in the community programming activities shown on the broadcast. Each episode of “This Week at Canyon Lakes” is created in much the same way as a traditional newscast. Residents plan the show at a weekly meeting in collaboration with Brookdale associates. The residents write, film, host, and produce the program. The broadcasts are created with technology including a video camera, iPad, Teleprompters, specialized lighting, and video editing software. Segments are filmed in the onsite studio and on location at community events, outings, trips, and cruises. The team has filmed on location at numerous points of interest in the Pacific Northwest as well as in 10 states, eight countries, and two continents. Producing the newscast offers a satisfying experience for the residents by giving them an opportunity to be active participants in creating and leading their community’s programming. It fosters a strong sense of purpose by allowing them to showcase their talents and achieve personal goals. It also gives them a forum for sharing those goals for the enjoyment of others. One resident was able to fulfill her dream of broadcasting in New York City when she and two other residents co-hosted an episode from the middle of Times Square. Other favorite filming locations have been Alaska’s Inside Passage, Hawaii’s Napali Coast, and the Panama Canal. One of the most popular stories followed 90-year-old Myrlen McKinnon as she took a zipline tour through the Costa Rican jungle. More than 20 residents now participate regularly in the broadcast, which began with a small group when the program was founded in 2015 by Joe Green, now a sales manager at the community. Initially, the residents were intimidated by the idea of producing their own broadcast. However, they quickly became comfortable with the process and with the technology needed to make it happen. The broadcast is shared with viewers through Facebook, Vimeo, and email. Viewer engagement is measured through social media interaction with the posted videos and by gathering anecdotal feedback from residents and family members. One of the most popular recent posts reached more than 5,000 people and received 200 likes and comments on Facebook. 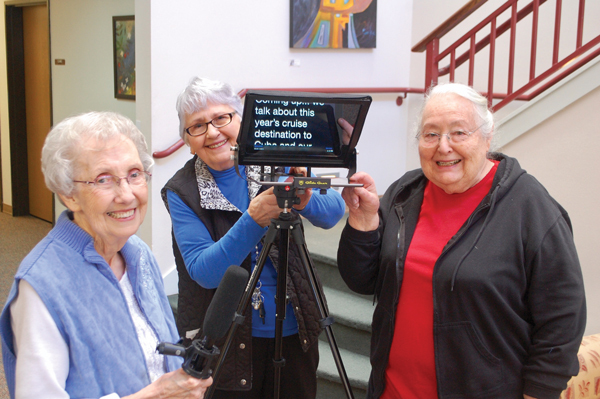 The broadcast has also been featured in regional media including the local newspaper, several news stations, the PBS show “Northwest Profiles,” and Brookdale Senior Living’s Optimum Life magazine. In total, the show has been watched more than 50,000 times in over 60 countries. The success of “This Week at Canyon Lakes” has prompted community leaders to encourage more residents to participate. Recently the community reached out to another nearby Brookdale community in Spokane to invite them to be included in an upcoming broadcast. Community leaders have also proposed a plan to Brookdale corporate to create a training and process guide to mentor other Brookdale locations that want to create their own community broadcast. Spending time with children and young people can lift the spirits, boost mood, and raise energy for aging adults. In November 2017, Senior Living Communities launched its Joining Older and Younger (JOY) program to bring the two generations together in unique ways. The program partners with outside youth organizations to plan intergenerational activities both within and outside the communities. JOY focuses on social and wellness activities that are equally rewarding for both older and younger participants. Shoot for the Birdie is a wellness activity that partners residents with members of a high school girls’ golf team for a bimonthly miniature golf competition. Other wellness activities include monthly pickleball games with middle school students and a Nutrition 101 series presented by college undergrads. Social activities in the JOY initiative include SAGE (Successful Aging and interGenerational Experiences), which paired college students with residents who have the background to mentor them in their chosen career fields. Many of the relationships continued after the official seven-week mentoring period was over. 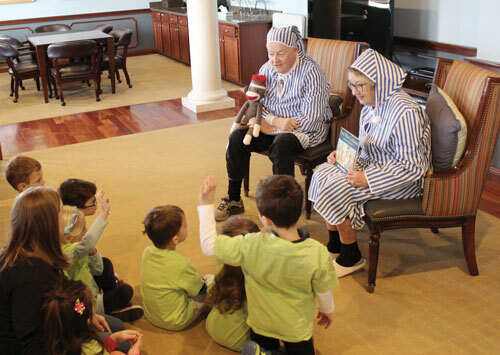 In another JOY social activity, residents read to preschool students while dressed as characters from the books they were reading. The increased interaction with younger generations has enlivened the culture in the communities. Residents are invigorated by the energy and enthusiasm of the children and youth who participate. Those who rarely get to see their own grandchildren or great-grandchildren appreciate the chance to spend time with kids. This has proven to be effective in wellness and social programming, resulting in higher attendance, healthier lifestyles, and the fulfillment of Senior Living Communities’ goal of promoting a “Weller Life.” As the program has grown, resident participation remains strong. Involvement of partner organizations has also increased as word spreads about the initiative. In turn, the young people have become more appreciative of older adults and more comfortable with the senior living environment. They’ve also seen that older people–including those in senior living communities–can still be active, vibrant, and fun-loving. Overall, JOY has left a lasting positive impact on participants at both ends of the age spectrum. The initiative has helped residents and young people form strong bonds that benefit everyone. It also helps engage residents with the wider community around them. In some cases, the parents of young participants have gotten involved in the program as well. Key to the program’s success is its focus on long-term partnerships rather than one-time events. Spending time together on a regular basis forms the bonds that build lasting relationships and can change lives and outlooks. 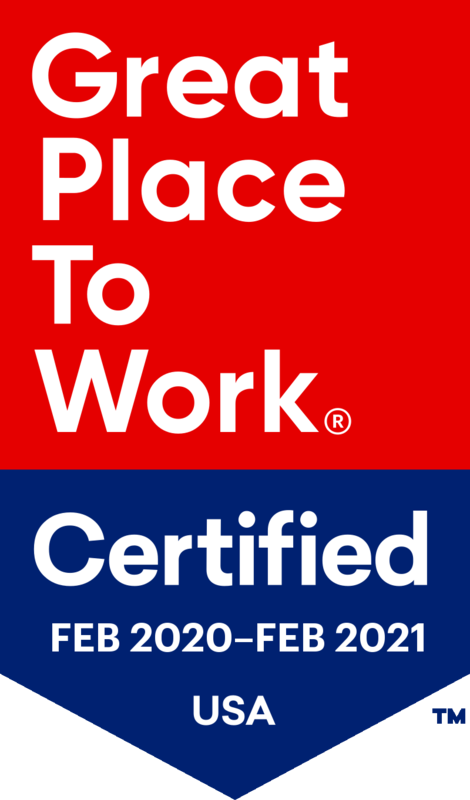 To achieve this goal, wellness and social directors at each community are encouraged to develop long-term partnerships with local youth organizations. Each community chooses its partner organizations to suit its specific needs. Plans are to continue expanding the program by growing participation from both residents and youth organizations. Specific plans include growing the wellness side of the initiative with an extensive aquatics program. Aquatics are very beneficial in helping older people improve balance, strength, and appetite. The search is on to find new organizations to partner with in order to keep residents and young people connected and engaged across generations. In order to better serve their residents, many providers are moving away from “one size fits all” programming. Community leaders at Benchmark’s The Village at Buckland Court found that over time, the interests and abilities of their residents had diverged to the point that one set of programming no longer suited the entire resident population. Community leaders looked for ways to keep the more independent residents better engaged. Their forward-thinking solution was to get them actively involved in planning an adult educational program that would be intellectually stimulating and appeal to their current interests. Adult education is an effective way for communities to help residents remain active, engaged, and connected to what matters most in their lives. To design the program, the community invited residents to join an Adult Education Council aimed at defining their educational needs and wants. All residents were invited to attend a series of four meetings, each with a specific agenda. In addition, residents were surveyed to determine the interests they shared and which specific topics and programs they might be interested in learning more about. Using the information gathered at the meetings and through the surveys, the Council planned a semester-long program of courses on a variety of subjects. One or two classes were offered each day at the community. The first semester lasted from October through December 2018 and included 35 classes on subjects such as Music Theory, Advanced Acrylics, Exploring the Creative Writer in You, Touring the Galapagos Islands, and Wine Tasting 101: An Introduction. As part of the educational series, the community organized tours of Mashantucket Pequot Museum and Research Center to learn about Native American history and life in the region. They also arranged bus excursions to the Wadsworth Athenaeum, the Connecticut Freedom Trail, the Nathan Hale Homestead Museum, and the Connecticut Historical Museum. Classes are offered in person, online, and in experiential settings. The mix of formats has been positively received by the residents. Several residents have also served as instructors, giving them a unique opportunity to share their knowledge and interests with other residents. 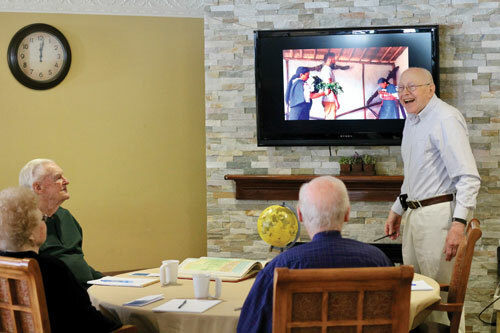 Although most senior living communities offer continuing education classes, the Village at Buckland Court program is innovative in its use of direct input from residents to plan the course offerings. Benchmark’s mission is to elevate human connection, and this program serves that goal by bringing residents together to share their common interests and design their own programming. An unexpected benefit has been strengthened relationships and newfound friendships among residents because of these shared experiences. Having residents involved from the beginning also fosters a feeling of investment that results in greater participation. “At Benchmark and at The Village at Buckland Court, we truly believe that we are better together and this is a fine example of our associates and residents coming together to create something we can all share in and grow from together and as individuals,” said Doug Murphy, executive director of The Village at Buckland Court. The program has fulfilled its intended goals. It has led to higher engagement among residents as well as their family members. Residents have formed new friendships through the planning process and the classes themselves. It also fulfills Benchmark’s goal of keeping residents’ minds active and engaged in lifelong learning. Community leaders will continue to collect feedback through the Council and from class participants. The program will be updated regularly to reflect the changing needs and desires of the residents. Eventually the classes may be opened to seniors living outside the community. The second semester begins in March 2019.